Home » How to Manifest » What is Manifesting? Manifesting is intentionally creating what you want. Everyone has the ability to manifest anything they desire – wealth, optimum health, love, houses, cars, peace of mind… It's just that we're not taught this growing up. We're taught that we have to work hard and that the rich get richer, while the poor get poorer. The truth is that the power to manifest lies within you. Whatever you think about, you are manifesting into your life. If you constantly think about what you don't want to have happen, that is exactly what you will manifest. But by learning the secrets of manifesting, you can begin to change your thoughts and your life. You can remain focused on what you want to happen. And soon, your greatest desires will manifest. You've probably noticed that you're constantly thinking about something – about where you want to go or what you want to achieve. Your mind is always thinking and manifesting something. That's why it's so important to know exactly how to use your manifesting power. Everything happening in your life is a reflection of what is happening inside of you. Whatever you focus on will take shape and manifest into your daily life. Of course, you know that not everything you think about manifests. Otherwise, every time you thought about an elephant, one would appear before your very eyes. That's because the speed at which your thoughts manifest depends on how much resistance you have to their actual appearance in your reality. Resistance is why no matter how much you may think about what you want, it doesn't appear. Your resistance doesn't allow it. Until you get rid of the resistance, your desires won't manifest. But as you eliminate resistance, your desires will manifest faster and easier…sometimes manifesting instantly! So what are you thinking about now? 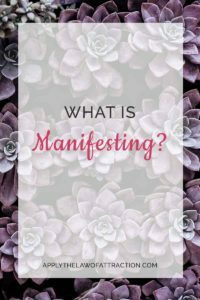 What is manifesting in your life?